A fellow of Trinity College, Cambridge, and of the Royal Society, William Clifford (1845-79) made his reputation in applied mathematics, but his interests ranged far more widely, encompassing ethics, evolution, metaphysics and philosophy of mind. This posthumously collected two-volume work, first published in 1879, bears witness to the dexterity and eclecticism of this Victorian thinker, whose commitment to the most abstract principles of mathematics and the most concrete details of human experience resulted in vivid and often unexpected arguments. Edited by Leslie Stephen and Frederick Pollock (a close friend and colleague), the essays show Clifford's thorough engagement with scientific thought as a method for illuminating ethical and moral questions. They include 'On Some of the Conditions of Mental Development', 'On the Scientific Basis of Morals' and 'The Ethics of Belief'. Pollock also supplied a biography which focuses on Clifford's devotion to the principles of scientific enquiry and experiment. Volume 1: Introduction: 1. Biographical; 2. Selections from letters, etc. ; 3. Bibliographical; Lectures and Essays: 1. On some of the conditions of mental development; 2. On theories of the physical forces; 3. On the aims and instruments of scientific thought; 4. Atoms; 5. The first and last catastrophe; 6. The unseen universe; 7. The philosophy of the pure sciences. 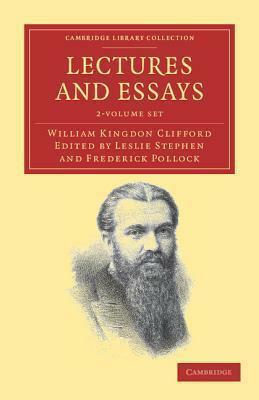 Volume 2: Lectures and Essays continued: 8. Instruments used in measurement; 9. Body and mind; 10. On the nature of things-in-themselves; 11. On the types of compound statement involving four classes; 12. On the scientific basis of morals; 13. Right and wrong: the scientific ground of their distinction; 14. The ethics of belief; 15. The ethics of religion; 16. The influence upon morality of a decline in religious belief; Cosmic emotion; Virchow on the teaching of science.